The cat is a specialized tool for developing faster lateral movements. Attached to two anchored resistance bands, the athlete works against resistance in 360 degrees. This piece of equipment allows the athlete to go forward, backward, and side to side. By connecting the elastics end to end, the Cat can double as an overspeed training device similar to the single man overspeed. Includes 1- Cat belt, 2 - 8' SlastixTM, and 2 - anchors. The cat is a specialized tool for developing faster lateral movements. This piece of equipment allows the athlete to go forward, backward, and side to side. 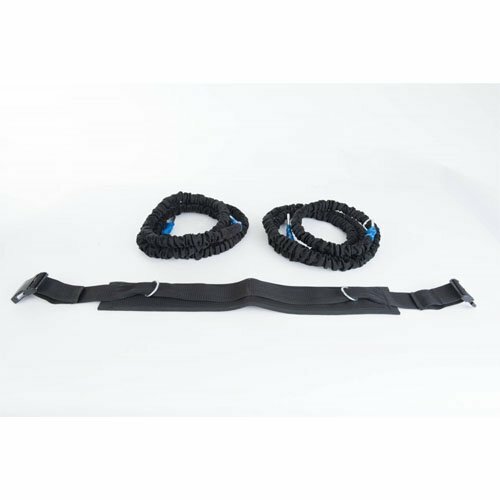 Includes 1- Cat belt, 2 - 8' SlastixTM, and 2 - anchors. If you have any questions about this product by STROOPS, contact us by completing and submitting the form below. If you are looking for a specif part number, please include it with your message. FitCord “ELITE” Band Load Kits. American Made. Home & Portable Gyms include 5 Highest Grade Safety Sleeve Bands, Handles, Door Anchor, Ankle & Wrist Straps, Bag & Exercise Manual. Lifetime Warranty. FitCord “BOSS” Band Load Kits. American Made. Home & Portable Gyms include 6 Highest Grade Safety Sleeve Bands, Handles, Door Anchor, Ankle & Wrist Straps, Bag & Exercise Manual. Lifetime Warranty. FitCord 6 Pack - Premium, Covered Resistance Bands for Fitness and Exercise. Includes 6 Resistance Levels (7lbs-55lbs) and Door Anchor.